The little village I live in has finally had fibre enabled and I have to say that I was over the moon being a heavy internet user. 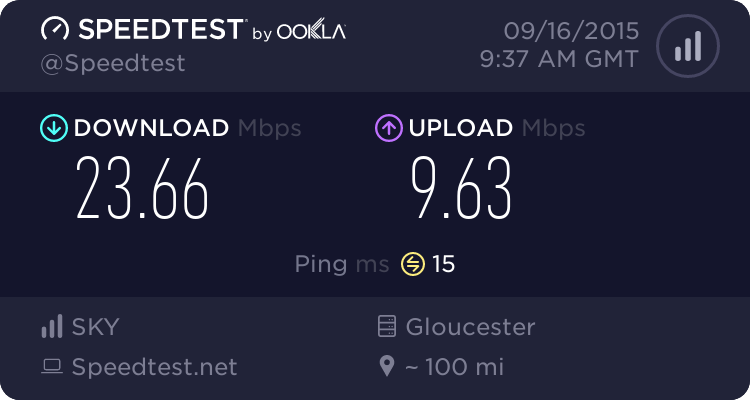 The biggest problem was my current ISP they were offering amazing deals but only to new customers. I had multiple discussions with BT only to find that they couldn’t offer anywhere near the new deals they offer customers. Sat here at my desk extremely annoyed with the fact that new customers were getting Fibre for the same price that I was paying for normal ADSL being £27 a month and best they could do for me was £39.99 over 18 months. This was really annoying for me because you would have thought being a loyal customer might actually mean something to them, based on the phone line has never been with anyone else and the broadband had to have been with them for about six years or more. The excuse that the advisor made as a new customer back then you would of had the best deals and that showed how much he did know because in actual fact I was paying more when I first joined and then over the years I have managed to get it down to a more respectable price. I think when we first started with BT as a broadband provider it was £25 a month just for the broadband, not including any calling plan and line rental. So with all this I decided to look around for a better deal and Sky being second biggest provider in the UK and offering my current deal with BT but on Fibre for £30.40 a month over 12 months it was a no brainer. That said though I wanted to give BT a chance, being the loyal person I am and it turned out they couldn’t even offer me the original deal they had quoted me they had said £39.99 over 12 months, now it was over 18 months and with that I highlighted how long I had been with them and that I was a new customer to their infinity package if I took it out and what Sky had offered and they put the phone down on me. With the putting down of the phone BT had sealed their own fate although really not wanting to change the line, there was no other way around it. I phoned up Sky and explained what I wanted and ended up going up to £34.40 a month because I took out Anytime Calls because it fits more into our phone usage. So ok we are talking an increase of £7 a month but hopefully there will be no call charges like we were getting with BT only having Evening and Weekend Calls. As an added bonus now with Sky you get Caller ID for free which is another £2.50 a month on BT. Everything set up and ready to go I have to admit I did have a few discussions with Sky and found their support to be far better at answering the questions I had so I locked in the date for the switch, although at this point being the first time the line wouldn’t be with BT nerves were high. True to their word however a welcome letter came highlighting the package and costs along with the speed I should be getting and date of transfer. However that did not settle the nerves because I still didn’t have any equipment, on the 10th September what came to my door the sky hub and then it just sat there then until the 14th switch-over day. The switch over day was one of the worst bits now because about 5 am the BT Home Hub had disconnected and my understanding over it was that I wouldn’t really lose service as I would just plug the Sky Hub in and away I went. So about 6 am I switched them over and I didn’t have any internet, although it wasn’t what I had expected I thought they did say up until midnight tonight to go completely through maybe. So as a test to see whether the phone was working phoned the landline and saw that my mobile number had appeared so I thought great Sky has the line and at least the landline is working. Then about 12:30 pm everything just went white and smiley I was connected and to be fair at 39.9998 megs download 9.99999 meg upload so going to my main machine I tested its speed and it was getting 20 megs down 9 up. As its a distance away from the hub wirelessly I decided to sit in the living room with my Chromebook and got 37.65 meg so there was a sigh of relief it was all working. I have to say the whole switch over has been nerve racking and a positive experience, why BT as a company do not reward loyalty is beyond me but if you’re thinking about changing providers my advice do not think twice, because in my experience although was what I was expecting in places it went through quite smoothly. 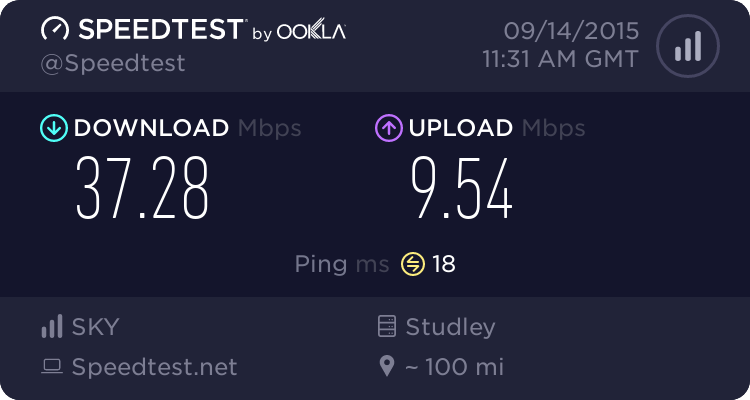 The only negative think I have to say about Sky two days in is that the spec of their Sky Hub 2 leaves a lot to be desired I have found that from my main desktop I can get speeds anywhere between 30 meg going all the way down to 2 meg purely because of the wireless. I know that they can’t control that to some degree but the lack of 5ghz as well seems to hinder it. As the BT Home Hub, 5 did seem a lot more stable. I am hoping to change my network set up today a bit and see whether I can’t make a few changes and see whether I can solve the issue so watch this space.